As we walked down Coldwater Road, we were drawn to each of the unique shops and restaurants that are the fingerprints of this beautiful village. Coldwater Village has a long history, going back to the 1800s. The Coldwater Mill is now a museum with displays showing the history of Coldwater and how the village has evolved and grown. It was a beautiful day so we walked up and down Coldwater Road. 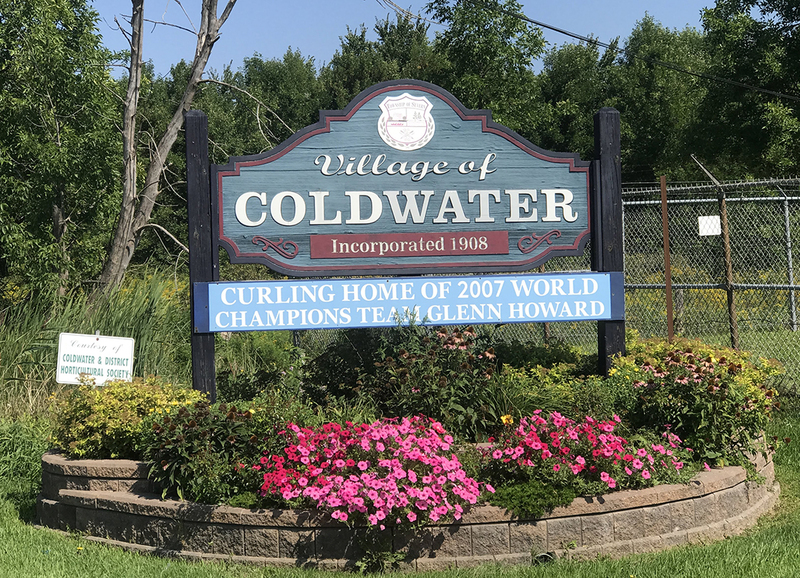 As we stopped in each shop, we found that the owners were very proud of the Coldwater heritage and their community, ensuring that we knew of other unique shops that are a must to be visited. It’s hard to say if we had one favourite place that we stopped in. This fun gift shop is focused on, yes, you guessed it, Christmas. But don’t let that fool you. The Christmas Villager also has seasonal items and gifts for all occasions. We were excited to have started our Christmas shopping that day! The Back in Thyme store was filled with locally made items and antiques from Coldwater. The owner of the store told us so much about Coldwater, the people who used to live there and the history of his building. The building itself is an antique. Built in 1908, the Borland Block includes his store and Em’s Cafe. An addition was made to the building and now is home to Subway. It was the Bank of Toronto (later Toronto Dominion) for 30 years. You can still see where the vault was, though the vault doors were removed. The ceilings are 12 feet high and are finished with the originally tin. We really enjoyed our lunch at Em’s Cafe; so much so that we wrote another post about our amazing experience. This shop was not something that we were expecting to see. The Harry Potter display at the front of the building is what caught our attention. When we tried to find our way in to see what else they had, we discovered the entrance at the rear of the building. It wasn’t a Harry Potter store, but yet a Steampunk Factory. The girls were awed by all of the hand-crafted items. The owner, Phill Holder, took his time to tell us about the items on display in his store and how they were made; none were the same. He has many artisans display their work in his store. When we asked about the Harry Potter things out front, he let us know that they had had a Transfiguration Festival, where over 5000 people arrived in Coldwater to celebrate all things Harry Potter. Some of the artisans who display things in his store, had created Harry Potter themed items for that weekend. Phill also helps to organize the Coldwater Steampunk Festival. As we knew we were eating lunch the following day at Em’s Cafe, we stopped in at Tiffany Restaurant for lunch. Walking into Tiffany Restaurant, you can tell you are in a small town, where everyone knows each other. The staff were super friendly, and greeted everyone as they walked through the door. Each person we talked to said, “You must stop at Coldwater Ice Cream!” So we did. And it was delicious! They hand scoop Kawartha Lakes Dairy ice cream, plus they have milkshakes and other sweets. Rachel had Cookie Dough, Lauren had Cookies ‘n Cream, and Craig and I shared a cup of our favourite – Black Raspberry Thunder! We ended up spending a lot more time in Coldwater than we originally anticipated, and we wouldn’t have changed a thing! The village may be small in size, but it is filled with so many amazing people and experiences. Be sure to visit Downtown Coldwater if you are in the area. We just touched on a few of the shops and restaurants, but there are so many other unique places to visit.